Lovely treetop one bedroom plus study high-rise condo on the 6th floor of this full service building. Master bath has double vanities and separate bath and shower. A multitude of amenities include pool, tennis courts, hot tub and fire pit, party room and valet services. 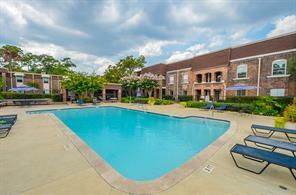 Enjoy resort-style living on the campus of The Houstonian with additional fitness spa, club, hotel and dining. A wooded sanctuary of approximately 4.1 acres in scale offering a remarkable opportunity to acquire a piece of Houston history. Tranquil and private setting showcasing the natural bayou border and prefaced by some of Memorial’s most exceptional estates. All land sizes and boundary lines are approximate and subject to final platting. A wooded sanctuary of approximately 2.2 acres in scale offering a remarkable opportunity to acquire a piece of Houston history. Tranquil and private setting showcasing the natural bayou border and prefaced by some of Memorial’s most exceptional estates. All land sizes and boundary lines are approximate and subject to final platting. 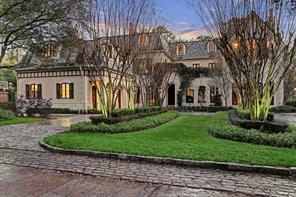 Exquisite 2 acre estate in prestigious gated enclave. Quality abounds in this magnificent French Country Chateau. 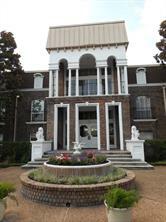 Striking slate roof, hand matched mahogany woodwork, mahogany windows, imported French antiques & Venetian plaster walls. An abundance of windows & the master balcony overlook picturesque grounds. Generous formal living rm w/stone fireplace. Spacious oval dining room allows for entertaining with ease. The 1st floor game/party room features incredible 18th Century French paneling & wet bar. 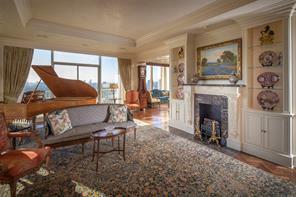 The handsome library is appointed with an antique Belgian deco mantel & built in display area. The den, breakfast room, kitchen & conditioned Sun Room allow for intimate or large scale entertaining. Temp controlled wine cellar w/dining area. Private Master retreat w/separate study & luxurious bath. Spacious EnSuite BRs w/balconies. Qtrs/Guest Suite w/kitchen, living rm & Bedroom w/separate entrance. 3 car garage, porte cochere, elevator capable to all floors, Pool & spa. An amazing home! Refined home in gated Saddlebrook surrounded by nearly an acre of professionally-planned gardens, patios, and pool/spa. This residence was custom-designed for the sellers by Thomas M. Lonnecker, AIA, w/ light-filled interiors created by award-winning Lucas Eilers Design. The open, airy floorplan accommodates the breezy daily life of a busy family and provides an elegant entertaining venue for gatherings of any size. Features include a façade of Granberry, Texas stone; Greenboard drywall; copper gutters and downspouts; a Creston/Lutron smart-house system; all-floors elevator; custom stone fireplaces; and screed-laid hardwood floors throughout. Spacious formal rooms; inviting wine room + temperature-controlled vault; professionally-equipped gathering kitchen/breakfast room/great room overlooking the loggia and pool; first-floor master suite w/ spa-inspired bath; en suite secondary bedrooms; finished/climate-controlled third-floor flexible room; abundant built-in, closet, + attic storage. Sleek modern home nestled on a 57,449 SF lot (HCAD) on desirable Sherwood Forest cul-de-sac. Walls of glass create incredible vistas that make this truly an indoor/outdoor home. 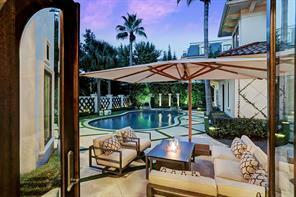 The expansive grounds feature a lighted tennis court, pool, patios, koi pond and waterfall. With multiple living areas, the home offers great flow for entertaining as well as individual spaces for daily living. Fabulous kitchen and adjoining family room plus den, formal living room and spacious dining room. The master suite has an airy bedroom with fireplace, floor-to-ceiling windows and 2 exquisite master baths with impressive closets. Desirable SECOND BEDROOM DOWN. Chic powder room. Sophisticated upstairs game room. Huge balcony overlooking the private setting. All bathrooms renovated in 2018* with indulgent features. Fully equipped caterer’s kitchen. Lutron Lighting. Roof 2016*. *=per seller. 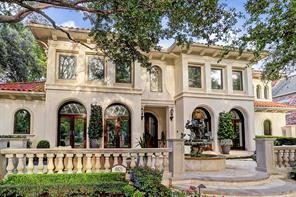 Mediterranean showpiece nestled on gorgeous corner lot. Twin limestone balustrade patios introduce this home that has been completely updated inside and out. It boasts Venetian plaster walls, marble floors, Mother of Pearl tile accents, handcrafted millwork & beveled glass fanlight transom doors. Colossal crystal chandelier and wrap-around Juliet balcony empowers the grand reception hall that unites with two story library, sitting room, wet bar, kitchen and dining room that features estate size limestone fireplace and stunning views of the European-flavored rear grounds. Gourmet kitchen features marble counter tops, Sicis glass tile backsplash, Viking appliances, SubZero fridge/freezer, butler’s pantry & massive honed granite island. Family room boasts giant multi-tiered skylight, whimsical onyx bar & aquarium. Master suite has arched French doors opening to the pool & spa. Lavish marble bath & 2 Programme Martin closets. 5 additional bedrooms, study hub & theatre. Sophisticated, private, an entertainers dream. State of the art home automation Crestron System controls lights, audio, security, thermostat & cameras. 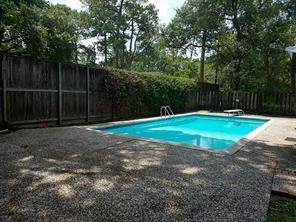 Beautiful outdoor patio area with summer kitchen, pool, basketball sports court, & batting cages. Sizable game room/media room above 5 car glass door garage, additional movie theater/media room, 2 utility rooms, 5th room could be used as attached guest quarters, 1st floor office & master bedroom. Fully fenced and gated. Prime location! A stunning showpiece nestled on a gorgeous corner lot. Twin limestone balustrade verandas introduce this completely updated home inside and out. It boasts Venetian plaster walls, marble floors, Mother of Pearl tile accents, handcrafted millwork & beveled glass fanlight transom doors with a wrap-around Juliet balcony that empowers the grand reception hall uniting the two story library, sitting room , wet bar, kitchen and dining room that features estate size limestone fireplace and stunning views of the European-flavored rear grounds. Gourmet kitchen features marble counter tops, Sicis glass tile backsplash, Viking appliances, SubZero fridge/freezer, butler's pantry & massive honed granite island. Family room boasts giant multi-tiered skylight & aquarium. 1st Floor Master suite has French doors to the luxurious pool, outdoor kitchen & spa. Lavish marble bath & 2 custom designed master closets. 5 addtl guest bedrooms, study hub & flex/theater room. Elevator capable. This magnificent Mediterranean home by O’Connor-Gill which is located in the Pine Wood Estates subdivision is complete with 5 bedrooms, 4 baths, 3 half baths, gameroom, media, wine room, family room with master bedroom down. Master suite is overlooking gorgeous pool with spa. Study adjacent to master suite. Stunning travertine floors. 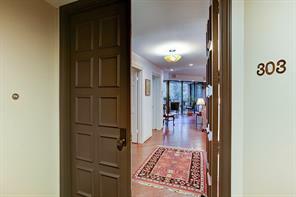 Hand carved doors throughout the house. Fantastic wet bar area with windows looking into beautiful landscaped yard with a summer kitchen and fireplace. Outstanding & luxurious, this penthouse on the 26th floor of the Houstonian Estates encompasses all that is comfort & beauty. With unparalleled 360 degree views of Houston, this full service building is the perfect & most leisurely place to call home. Direct elevator access into the unit, elegantly brings you to the foot of your foyer & welcomes you into the sumptuous penthouse. Custom designed layout w/ formals, gourmet kitchen, media room, wet bar, study & office. Dual master bedrooms w/ exceptional closets, balconies & spa like baths encased in marble. 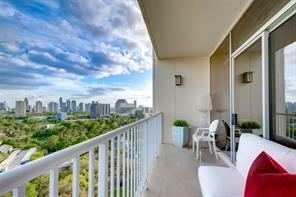 Views over Memorial park, Downtown & Galleria from almost every room, make day to day living incredibly scenic. Also, featuring finishes nothing less than excellent such as Venetian plaster, tray ceilings w/ cove lighting, designer wallpaper, mahogany wall paneling, marble, hardwoods & travertine floors. Endless building amenities include 24hr concierge & valet, swimming pool, rooftop tennis court, track, dog park & so much more! This Acadian inspired, five bedroom home offers a rare opportunity for more recent construction in the highly sought after Huntleigh Subdivision. The location has urban convenience with the appeal of Memorial living. Cast stone gas fireplaces, 11’ ceilings and tasteful trim add to the classic charm of this spectacular residence. Elegant formal dining and living spaces flank a welcoming foyer. The first floor also features an amazing Master Suite, a handsome study, and an open concept kitchen/living area with butler's pantry. A separate entrance under the porte-cochere opens in to mudroom, office and laundry areas and offers back stair access. Four bedrooms, as well as a playroom and study alcove with desks are on the second floor. A covered patio with lounging area, fireplace and separate grilling/dining area are highlights of the back yard. Additional features of this home include audio/video wiring, alarm system, automatic mosquito system and electronic driveway gate. 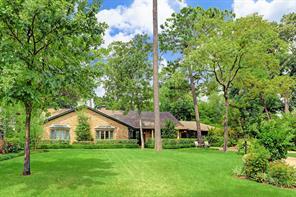 Elegant home in coveted Bayou Woods on just over a half an acre lot. Sweeping floor to ceiling windows with 22 ft high ceilings greet you upon entry, overlooking the pool and summer kitchen. Custom finishes throughout, this home includes formal living and dining, wet bar plus butler's pantry perfect for entertaining, library/study with fireplace & vaulted ceilings, chefs kitchen with open plan to family room, master suite with separate sitting room, and upstairs gameroom with bar +media room! 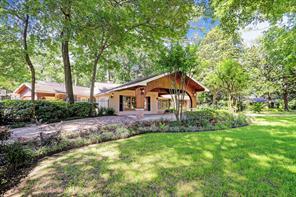 Elegant O'Connor/Gill Contemporary residence located on Stable Crest Blvd in Stablewood. Premier location. 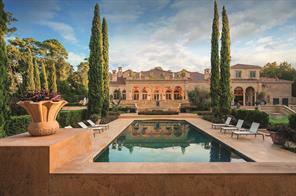 Magnificent entertaining spaces with great flow, all overlooking a beautiful pool. Gracious master suite on first floor with grand bath, closet, and dressing area. Library adjacent to master suite with lush garden views. Three guest bedrooms and an entertainment area upstairs. Other amenities include two powder rooms, elevator, generator, two-sided fireplace, wine storage, summer kitchen, abundant storage, 2 car/1 car garages, +/-16,115 lot. Excellent price! 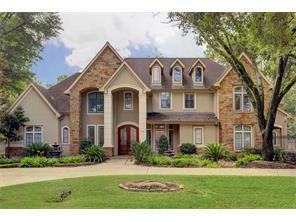 Elegant French stucco residence in Stablewood with premier corner location next to the 3 acre original estate. The custom home is situated with beautiful pool views from french doors throughout the first floor. Excellent flow for entertaining both inside and outside around the pool. Gracious master bedroom on the first level with sitting area and spacious bath and closet. Chef's kitchen opens to grand family room, two powder rooms, wet bar with wine storage, two wine coolers, three or four bedrooms up, media room, elevator, outdoor lighting system, one 2-car garage and one 1-car garage with wine storage. New roof and outside paint. Easy to show. Back on the market! Elegant O'Connor/Gill Contemporary residence located on Stable Crest Blvd in Stablewood. Premier location. Magnificent entertaining spaces with great flow, all overlooking a beautiful pool. Gracious master suite on first floor with grand bath, closet, and dressing area. Library adjacent to master suite with lush garden views. Three guest bedrooms en suite and an entertainment area upstairs. Other amenities include two powder rooms, elevator, generator, two-sided fireplace, wine storage, summer kitchen, abundant storage, 2 car/1 car garages, +/-16,115 lot. Excellent price! Wonderful traditional home on one of the larger lots in this highly secured area. Manned 24 hour guard gate with intense security throughout the development. Every room is generously sized and storage abounds everywhere. Two large bedrooms are on the first floor. The third bedroom and master are on the second floor. The master closet is more than the equivalent of three normal walk in closets. Recently inspected with all major items addressed. Special features include double pane Anderson windows and a full home Cummins generator for seamless enjoyment of your home during any power outages. Open concept living in the family room, kitchen and casual dining overlooking the lush back yard. More than enough room for a large pool and extensive landscaping. A spacious and updated home and rare oversized lot with mature trees in the coveted Sherwood Forest Section of Memorial is a must see! Priced at lot value and with over 4000sf of living space (HCAD) including large kitchen, formal dining, 4/5 bedrooms, 3 bathrooms, living room, study and master retreat--all on a perfectly situated 33,105sf lot with large inground pool--this property can easily be updated or your clients can build their dream home. 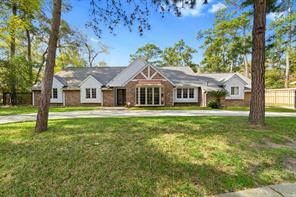 Gorgeous traditional nestled on a cul-de-sac backing to a beautiful ravine with bayou views and 3 acres of unobstructed bayou land views. Double door entry welcomes you into a two story entry opening into the library and living room, adjacent to the dining with stunning views from the floor-to-ceiling windows. Dining and kitchen are centrally located. Cooks kitchen with double ovens, gas grill range, large island and wet bar. Oversized breakfast room with spectacular views. Grand family room with stately fireplace. Master off of family room. Balcony with outdoor kitchen and covered patio nestled between the breakfast room and the family room. Superior master suite with large master bath and exquisite walk-in closets. 3 full bedrooms up with en-suite baths. Bonus room is currently used as a gameroom. A true gem. Pleasure to show. Meticulously maintained property on an over 19,000 square foot lot. Zoned to the award-winning Hunters Creek Elementary, Spring Branch Middle, & Memorial High. Beautifully landscaped by Gregory/Henry Landscapes, this property also features the Master and one additional bedroom (with en-suite bath) downstairs, a fabulous backyard including a large pool, upgraded overhead lighting throughout the home, recently replaced windows and doors, stunning wood floors, elegantly designed formals, island kitchen, large mudroom, and a bonus bedroom with full bath, perfect for guests or a live in nanny! Master bath is sleek and classic with marble counters and hex tile floors, standalone soak-in tub, separate shower, dual sinks and timeless finishes. This property has amazing flow and so much more to see! Dimensions are approximate. Please verify. Prestigious location in Memorial close in Pine Wood Estates zoned to the award-winning Hunters Creek Elementary, Spring Branch Middle, & Memorial High. With over 4,900 sqft and lot size over 21,000 sqft, the exterior features are just as impressive as the interior. This 5 bed/5 full bath is an excellent home for an active family or retirees. The new section of the home completed in 2009 includes a soundproof media room, second kitchen, I.T. closet, office with built-ins, & a conference room overlooking the exquisite backyard. The front yard is spacious, perfect as a sports field for kids with night lighting! The oversized driveway provides an abundance of parking for guests & leads to the impressive oversized 3 car garage. The backyard is a private oasis with the custom resort style pool & hot tub, covered pergola, bar, outdoor kitchen, TV, & firepit for total outdoor enjoyment. 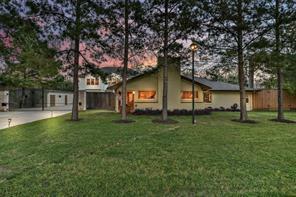 Just minutes from The Houstonian & easy access to 610, I-10, & Memorial Dr. this home is a must see! Wonderful gated community in close-in Memorial. Gorgeous designer home with formals, spacious family room, open island kitchen, 3 second floor bedrooms and large third floor with full bath and mirrored gym. Master suite includes a separate study with built-in work spaces and walk-in California Closet. Elevator capable. Beautifully landscaped patio and turfed side yard. Community pool and fitness center. 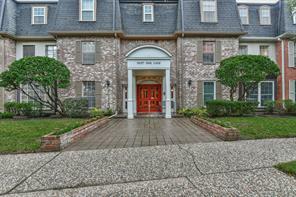 Fabulous location, just minutes from Downtown, The Galleria and City Centre. This 3-bedroom, 3-bath corner home represents the best of the Houstonian Estates and offers the most spectacular views of sunrises and sunsets. A wide foyer, with cove ceiling, welcomes you straight into the living room or go left into an updated island kitchen with tray ceiling. The flow is fabulous and lends itself to large gatherings. It is drenched in light through walls of glass, with a birds-eye view of the city below. The cozy dining room has a window seat with marvelous marble-top cabinets. An extremely large butcher block counter in the kitchen is excellent for serving cheese and wine. The large Master bedroom has great double closets and access to the third bedroom now being used as a den. The guest bedroom is truly large with walk-in closet and peaceful views. There are two spacious balconies facing north/west or south/east. Full-service building with 24/7 concierge, valet, heated pool w/spa, gym, tennis, party & card rooms. Great access to major freeways & entertainment. Fantastic opportunity in Close-In Memorial & SBISD on a lush 28,000 sqft lot; sprawling ranch impeccably maintained & beautifully updated throughout; gourmet island kitchen with Sub-Zero refrigerator, double oven & gas stove; desirable floor plan with three living spaces offers wonderful entertaining capability; private master suite, sitting area & generous closet space; bonus room off den is flexible space for many uses; enormous backyard has large covered patio, separate deck, mature trees & landscaping. 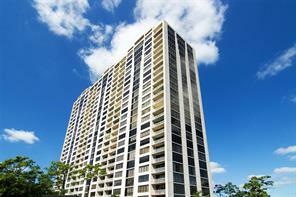 Elegant high rise living at The Houstonian. 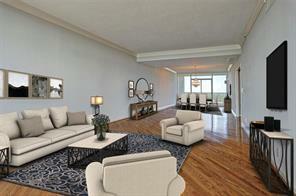 Beautifully updated two-bedroom with gorgeous views, living/dining room combination and custom wall paneling. A spacious master suite features a design alcove upon entering and has two large walk-in closets. The 2nd bedroom is currently a study. 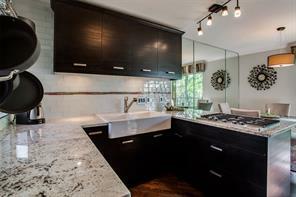 Kitchen includes granite countertops, Sub-Zero refrigerator, Wolf cook-top range and separate breakfast bar. Also features a butler's pantry with French doors for china & silver. The Houstonian offers 24 hr. concierge, valet, rooftop tennis courts, fitness center and pool. 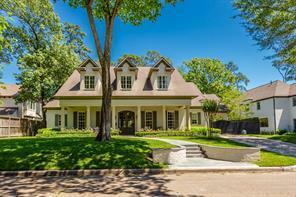 Close to Memorial Park and shopping districts of Uptown Park, The Galleria and River Oaks District. Located in a fabulous gated community within the Spring Branch Independent School District, this stunning Mediterranean style home has so much! Design highlights include beautiful hardwood floors, high ceilings, and a fireplace in the living room, The gourmet island kitchen Includes granite countertops and stainless steel appliances. Elegant master bedroom with a Juliet balcony and large, spacious walk-In closet. 2 additional bdrm+en suite baths & utility 2nd floor. 3rd floor has a gameroom w/wet bar and a 4th bdrm. Beautifully maintained exterior with a lovely landscaped courtyard entrance, rooftop terrace with covered sitting area and fireplace. 3 car garage. No Harvey flooding in the property or gated community. Large private wooded lot for sale. With a 3,108 sqft house in great condition ready to live in or remodeled to modern standards. 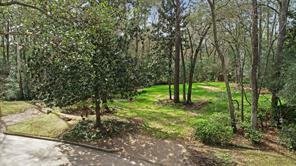 Nearly an acre of land (41,938 sqft) in Eastern memorial on the bayou. House has never flooded. As is condition with no recent repairs will verify no flood water. Very convenient location to get around town as well as in and out of town. Spring Branch Schools. Iron fenced back yard with automatic gate to access large parking area with over sized garage. No flooding per seller. Absolutely STUNNING 4 beds 2 1/2 baths home in the desirable memorial area just 3 miles away from Galleria Mall & Memorial Park. This beautiful home built in HUGE 15,744 sqft lot went through massive renovation from top to bottom in 2014-16. Salt water swimming pool w/ water feature & sophisticated spa controlled by remote (2014), Circle driveway + iron gate for privacy w/ remote control + 2 car garage + additional 6-7 cars parking inside gate. Siding, floors. Roof (2016).Water heater, high efficient AC, nest thermostat. Custom drapes & lighting throughout. Impressive open concept kitchen updated w/cabinets, granite, stainless steel appl, island. Added cozy built in benches-storage in breakfast room. gorgeous TOTALLY RENOVATED bathrooms+Gorgeous front door. Great floor plan. Lots of character w/ massive crown molding, chair rail, original wood floors (both formals) & bay window. Double pane windows. Spring branch schools! Ez access to 610 & close to down town. A classic Midcentury Modern with original architectural features, contemporary updates, and all the amenities to accommodate today's needs, this Memorial home is ahead of the curve in open-concept living! The gourmet kitchen has a granite-top dining island, built-in home office and a spectacular glass-wall view to a private backyard! The vaulted family room with its eye-catching period fireplace and tastefully understated dry bar opens through glass sliders to outdoor grilling and relaxing on a party-sized, bi-level deck! The large master suite also offers backyard views and access via glass sliders! 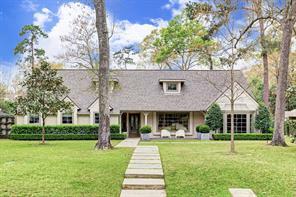 Set above picturesque Spring Branch Creek, which has never flooded this home, the over-half acre property boasts a lusciously wooded ravine and continues to creek center! With ample parking and easy access to restaurants, shopping, sporting events and cultural venues, the home is a refuge within a bustling urban environment perfect for city lovers who yearn for their own corner of nature! *DID NOT FLOOD DURING HARVEY. * Fascinating Mid-Century Modern home with a Southwest flair is the perfect oasis in the middle of the city. Enter the home through the dramatic, architecturally detailed porte cochere entry. Floor to ceiling sliding doors throughout the back of the home allows plenty of light and views of the lush backyard and Spring Branch Creek to be seen from most points in the home. Recently updated gourmet kitchen includes double ovens, wine fridge, and ample cabinetry for storage. 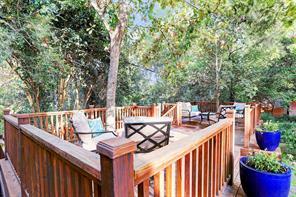 Enjoy the outdoors on the multi-level deck overlooking the ravine. 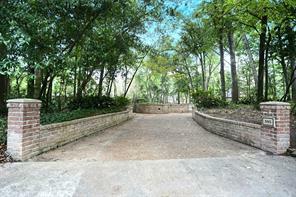 This park-like, wooded lot allows extra privacy in the heart of the city. Circle drive as well as parking behind the driveway gate. Recent HVAC system, recent carpet. 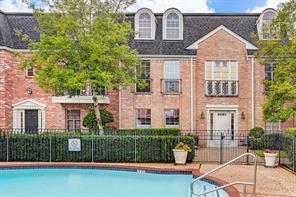 Great opportunity to own a two bedroom, three (full) bathroom unit (dual baths in master) on the sixth floor in the desirable Houstonian Estates Condominiums with tree top views of the lushly landscaped grounds. This unit features recent maple engineered hardwood flooring, carpet and paint, a large open living/dining area with floor to ceiling windows and a balcony viewing south, and a clean palette to update to your heart's desire.The Houstonian Estates Condominium is a full service building and includes : valet parking, concierge, swimming pool and outdoor grills, party room, card room, tennis court, jogging track, and an exercise facility. The Houstonian Estates Condominiums is serviced by the renowned Spring Branch Independent School District and is zoned to Hunters Creek Elementary, Spring Branch Middle School and Memorial High School. Welcome to your new home. 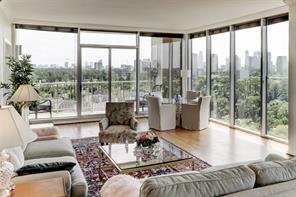 Escape from it all in your own private retreat on the 17th floor of the Houstonian Estates. Chock full of amenities, this building provides ease, security and a lock & leave lifestyle amidst the wooded grounds of the Houstonian Hotel. 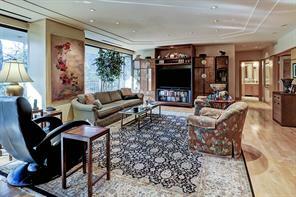 The elegance of this fabulous condo is apparent as you enter the foyer. The floor and accent walls are a beautiful travertine and the airy and sophisticated living room has space for two sitting areas with a balcony overlooking treetops and the Fay School. The light filled dining room has a wall of lit shelves for your objects d'art and easily accommodates a large dining table. The sizeable master suite has floor to ceiling windows with plantation shutters and a closet that has to be seen to be believed. Drenched in natural light the master bath offers double sinks, vanity, tub and shower with rimless door. The secondary bedroom has a separate balcony plus walk in closet. The temperature controlled wine room distinguishes this unit from all the others. Private, desirable, light+bright end unit home facing greenspace & park nestled amongst multi¬million dollar homes in exquisite close in location. All 4 BR w/ensuite BAs updated (‘13-‘18) including plumbing, fixtures, showerheads, towel bars, paint, & window coverings. 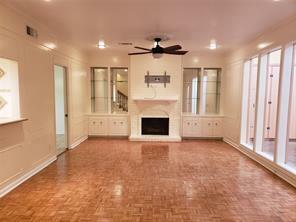 The formal LivRm and adjacent wet bar have custom Yost hardwoods. Featuring 3 levels (elevator capable), the 1st fl floor may be leased out or makes for a perfect game room/ in-law suite w/wet bar, bath & laundry hookups & separate entry. Spacious, open home w/great flow, classic formal living areas & large kitchen (w/new Viking double/oven microwave & cooktop '17-'18, Samsung dishwasher, washer/dryer '18) which is open to the den & sunny tree-top terrace. Enjoy the lock≤ave freedom w/the HOA fee covering all elect, heat, water, sewage, basic cable, landscaping, park, pool, exterior home & security gate maint. 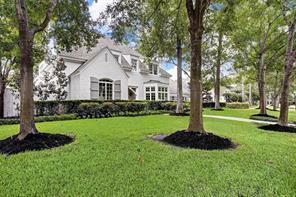 Zoned to highly sought-after Hunters Creek Elem & Mem. HS. No Harvey flooding! See agent for updates list. PRICED TO SELL!!! Great opportunity on this beautiful, free standing home. 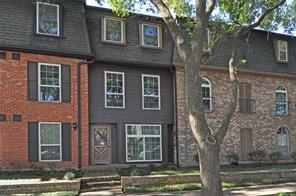 High End Gated Community In Memorial/Hunters Creek Area in Spring Branch school district. 3/4in solid hardwood oak flooring throughout! 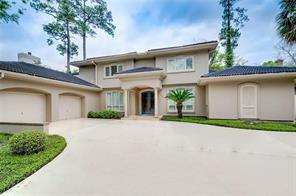 Granite countertops, stainless steel appliances, custom kitchen cabinetry, breakfast bar w/upgraded fixtures, upgraded tile, elegant staircase w/iron spindles, crown molding w/soaring ceilings, huge master bedroom and bathroom! Perfectly located in a gated enclave in Memorial, this well-maintained residence is a great value for its zoning to exemplary public schools and the easy commute to downtown, Memorial City, and/or the Energy Corridor. This stunning 4-bedroom, 4.5-bathroom residence has a floor plan that suits both a modern family or low maintenance urban living. Spacious open island kitchen flows into the living and dining areas on the second level for an exceptional entertaining area while outdoor living can be enjoyed on either the 4th floor terrace or the ground level patio/yard. Built by InTown Homes, 911 Queen Annes is surrounded by a number of restaurants, cafes and shops, and is just a short distance away from Memorial Park. 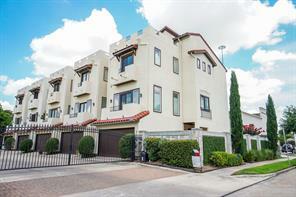 Magnificent move in ready home with a spacious two car garage and 3 balconies. Enter in to over 2700 square feet with 3 spacious bedrooms, custom two-tone pant scheme, and rich wood floors throughout the main floor. The great room features an elegant fireplace and is open to the dining area, ideal for entertaining your guests. The chef inspired kitchen is complete with stainless steel appliances, a gas range, stark white cabinetry and granite counters. Up on the second level is a small loft space fit for an office, an oversized bedroom with a private balcony to enjoy the cooler Texas evenings. The master suite offers an exceptional ensuite with a glass enclosed shower, an elegant jetted tub, and custom dual vanity. Step out on the upper deck to host your next BBQ and enjoy the unobstructed views. Have your evening meals out in your private yard with ample space to design your own garden. Add this one to your must see list today. 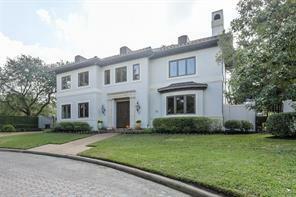 Stunning Mediterranean corner lot home in a gated enclave zoned to SBISD! Being a corner unit makes all the difference with regards to natural light and outdoor green space. 1st floor suite is large with a wet bar and double doors leading to the patio, which is actually large enough to entertain on! Use it as a flex room or bedroom...or both. Home is elevator capable which provides over-sized closets on every floor and the ability to add an elevator if desired. 2nd floor living area has high ceilings, lots of windows and defined living, dining and kitchen areas, while still being open concept. Stainless steel appliances, island with granite counter-tops, a breakfast bar and plenty of rich wood cabinetry adorn the well appointed kitchen. The master bedroom and another secondary bedroom suite are situated on the 3rd floor. Make your way up to the rooftop terrace for some quiet time with a morning cup of coffee or evening beverage. All this centrally located to great schools and more! ***HOME DID NOT FLOOD DURING HH***Beautifully updated Memorial town-home in a great location. Walking distance to Memorial Park, zoned to great school and convenient to wonderful shopping. Open floor plan with 2 story ceilings and lots of windows makes this town-home very light and bright! Private patio with lots of plants. 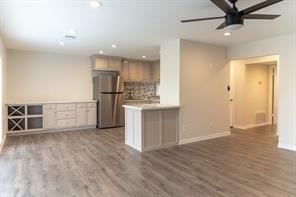 Home boasts triple pane windows for noise reduction, a 4 ton A/C, home theater equipment & movable IKEA-styled closet included, new appliances, new cabinets, textured walls, porcelain tiles and wood floors. This home also boasts smart features......WiFi thermostat, WiFi sprinklers, touch free faucet. THIS BEAUTIFUL HOME DID NOT FLOOD!!! 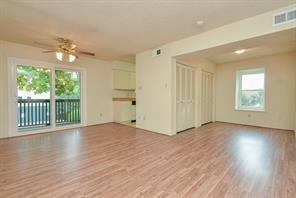 Well priced two story 3/2.5/2 townhome even has an extra 29’1”x11’10” ventilated sunroom area! Making it over 2850 sq ft living space per Seller! Roof replaced October 2018. Garage door replaced August 2018. Ceiling fan in den & 2nd bedroom replaced September 2018. Front windows were replaced and most of the plumbing was updated in prior years. Beautiful parquet floor and gorgeous half-bathroom on first floor. Kitchen and formal dining room has its own beautiful tiled floor. Beautiful spacious den, built-ins by chimney, crown molding, & 4 large windows look into the sunroom. Granite countertops in kitchen and 2nd bathroom. Sunroom with lots of storage space and laundry room; use it as a game room, storage space, entertainment room, or whatever you enjoy most! 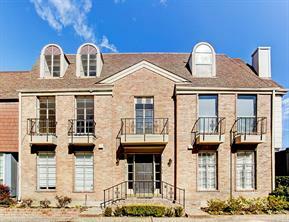 This jewel in LaFayette Place won’t last long! Hurry and make it your home today! 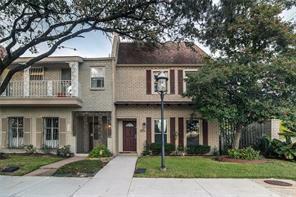 Beautiful updated townhome in private enclave in Memorial Courtyard and corner setting. This home has amazing curb appeal and has the largest floorplan. MASTER DOWN, en suite remodeled bath with dual sinks, 2 closets and huge shower with frameless shower door. Chef's kitchen with almost everything imaginable including separate ice maker, compactor and indoor propane grill. Dining room has atrium feel and living room has fireplace and wet bar. Another master up with fireplace and sitting room or flex space as needed. One more bedroom up and all bedrooms have en suite baths. Large 2 car garage with extra storage galore. HOA maintains all exterior of homes. Every home is redone on the exterior each 7 years or as needed. Lots of guest parking and easy access to 610, I-10, Memorial, Galleria, and Uptown Park. 15 minutes to downtown, 10 minutes to Galleria. 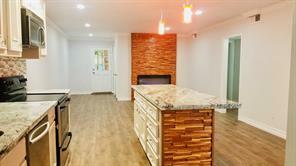 Beautiful, newly renovated 2 bedroom 2 bath with wet bar and wood burning fireplace. 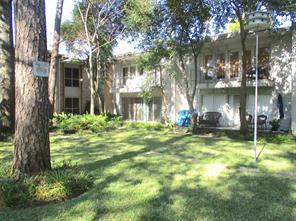 Fantastic, quiet, peaceful location on back side of the building over looking the pool and trees. New cabinets, hardwoods, granite counter tops, paint and fixtures. All appliances stay and owner is open to selling furnished. The Memorial offers 24 hour Concierge service, controlled access underground parking, daily trash pick up, pool, courtyard and multiple atriums. Owner is out of state resident, thus there are no exemptions for property taxes. 2017 taxes considerably less per Seller and available upon request. Easy access to I10 and 610. The perfect place to call home! Spacious 1,800 sq. 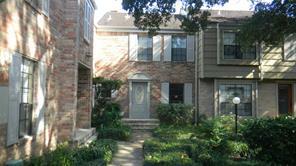 ft. 2 bedroom, 2 1/2 bathroom townhouse in a great location off Memorial Drive and the West loop. Zoned to Hunters Creek Elementary and Memorial Jr. & Sr. High School.Granite tops in all areas, new carpet, fresh stainless steel appliances included. Second floor full size utility room with washer and dryer included. Large Master bedroom with sitting area. Second bedroom big enough for 2 beds. "Soaker" type tub in master. bathroom.Quite dead end street. Large back patio area. Detached rear garage with private alley entrance. The utility room has been relocated into the home from the garage area. The home is a great value in a premium location. Memorial Park is within walking distance and the park golf course is being upgraded to host the PGA tour Houston Open! Call to set an appointment to see this lovely home in desirable Lafayette Place. Home has never flooded. Rare find! 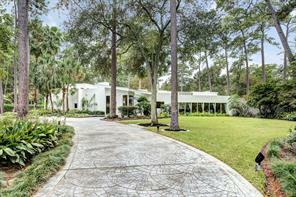 A true jewel amidst million dollar homes near Hunters Creek; Gated entrance through canopy of trees. Amazing 2 Story Entry with Hardwood Floors & walls of 2 Story Windows! 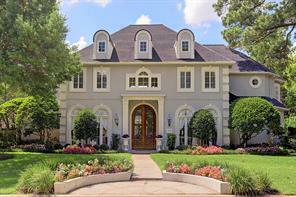 Elegant Formal Living & Dining Rm with Hardwood Floors, Plantation Shutters, & More! Wonderful Family Rm boast Dramatic Fireplace, Walls of Windows looking out to your Private Courtyard! 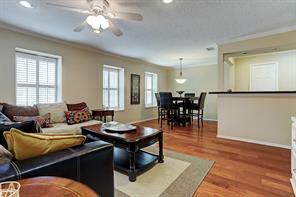 Family Room has Upgraded Hardwood Floors & flows gracefully into your Casual Dining Area! Notice all the beautiful Plantation Shutters! Casual Dining & Family Rm flows into the Gourmet Kitchen! Gourmet Kitchen has Breakfast Bar, gorgeous Granite Counters, Stunning White Cabinets, Deep Under-Mount Sink, Pull Out Kitchen Facets, Glass Tile Back-Splash & Marble Flooring! Wood Stairway leads you to the Stunning Master Suite W/His & Her Vanities, Shower & Deep Tub! Guest Suite has Private Bathroom! Monthly maintenance amount covers all utilities, electric, water, trash, building exterior, pool & cable TV! No flooding! 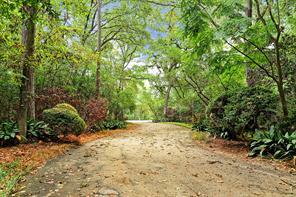 Your chance to live in the secluded and exclusive Memorial Woods townhome community! 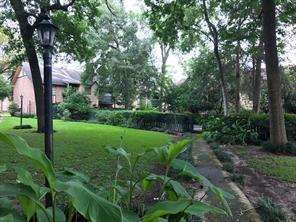 Tucked behind the majestic Houston's First Baptist, this sought after Memorial location is full of charm. Longtime residents have enjoyed this prestigious location with access to Houston's most exclusive restaurant, shopping, entertainment, and business districts. Tree-lined sidewalks and open green spaces create a lovely backdrop for your charming townhome. A rare 3 bedroom with 2.5 baths and 2 car garage with loads of storage, you'll have room for everything! Warm wood floors, updated kitchen and baths, and wood burning fireplace are just a few of the treasures you will find inside. Right outside the back slider doors, you'll find a quaint patio to indulge your love of potted plants or just a quiet space for your morning coffee and newspaper. The storage in the garage is to die for! Room for all of your hobby supplies or sports equipment. This home is not to be missed! Call today for your tour! REDUCED and READY TO SELL! GREAT LOCATION! Never flooded!! ALL BILLS PAID including electric, gas, water, sewer, upkeep of grounds and courtesy patrol included in maintenance fee. 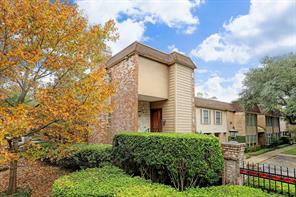 Large and spacious gated town home close to everything including Memorial Park and Houston hot spots. Many extras including huge master with two large walk in closets, large 2nd and 3rd bedrooms with walk-in closets, beautiful wood floors throughout, plantation shutters, deck, french doors in dining leading to patio/deck. Stainless appliances including new microwave. All appliances stay including refrigerator/washer/dryer. Tree-lined streets and conveniently located to all major freeways. Good schools and zoned to Memorial High School. 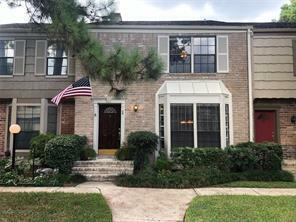 Move-in ready~One of the larger town homes in this high demand area and under $300k to live in one of Houston's most exclusive areas...this one won't last! 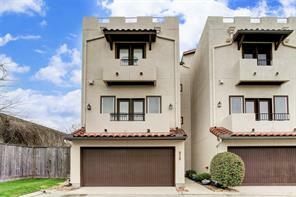 Close-in Memorial Townhome! A perfectly updated floor plan. A very PRIVATE AND QUIET unit. Gated with controlled access. Flexible space for Home Office or 3rd Bedroom. Wonderful kitchen with breakfast area, and yards of tasteful granite counters. Stainless appliances, designer wood look tile flooring (pet perfect), Large Bedrooms (double master like) with huge walk-in closets. Stylishly updated bathrooms, Master Bath with double vanities, huge step-in shower. The unit is located right over and viewing the Pool. With front and back doors. MAINTENANCE FEE INCLUDES ALL UTILITIES! Beautiful oak arched lined street and interior courtyards. Two covered parking spaces.Zoned to Memorial-SBISD. Sparkling Clean and Current, a MUST SEE! Close-in Memorial Townhome! A perfectly updated floor plan. A very PRIVATE AND QUIET unit. GATED with CONTROLLED ACCESS. Flexible space for Home Office or 3rd Bedroom. Wonderful kitchen with breakfast area, and yards of tasteful granite counters. Stainless appliances, designer wood looking tile flooring (pet perfect), Large Bedrooms (double master like) with huge walk-in closets. Stylishly updated bathrooms, Master Bath with double vanities, huge step-in shower. The unit is located right over and viewing the Pool. With front and back doors. MAINTENANCE FEE INCLUDES ALL UTILITIES! Beautiful oak arched lined street and interior courtyards. Two covered parking spaces. Zoned to Memorial-SBISD. Sparkling Clean and Current, a MUST SEE! 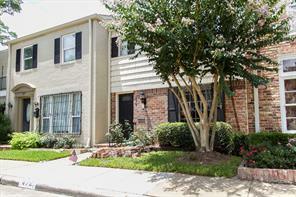 Lovely updated townhouse on the end unit in a gate community close to The Galleria. Dark wood floor on the first level. Large windows throughout the property bring in lots of natural light. Balcony overlooking the neighborhood pool. Family room with built-in cabinets and shelves, plus an accent brick wall. French door leads to a paved patio and access to the carport. Three bedrooms upstairs with remodeled bathrooms. Large walk-in closet in master bedroom with built-in shelves. Full size washer and dryer in the utility room under the staircase. This is a beautifully updated property ready for its new owner. If you want to be close in the city and move-in ready place, this is it. You will love this Beautiful 1,808 sq. ft. town home located in Memorial Area. It is in a gated community. Unit is on the 2nd and 3rd floor. 2 bedrooms and 2.5 bath. Spacious Living Room. Wonderful kitchen with granite counter and stainless appliances. 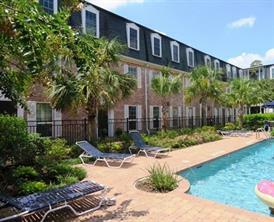 Convenient to Shopping Centers, Restaurants, Entertainment and Park. Close to the heart of the Galleria area. This great condo is located on a tree-lined street not far from the Galleria, Memorial Park and wonderful restaurants and entertaining. There are 2 bedrooms and a study which could be a third bedroom if needed. There is a great hall entry to the condo. As you enter you will see your kitchen with granite counters, great storage and wonderful appliances. The kitchen is open to the dining room and living room which keeps the cook involved in conversations and guests or family. The living room has some built-ins for storage and TV viewing. The study/bedroom also has built-ins and plenty of space to work. This home has great storage. There is a large hall closet. The master has a walk-in closet, private bath with great storage and lovely, spacious shower. The hall bath is also quite spacious. A stackable washer/dryer is also in the unit - how great is that! The unit comes with 2 assigned parking spaces. Welcome home! INCREDIBLE VALUE...The maintenance fee includes everything except internet per the seller! This breathtaking 1,680 sqft unit is situated directly off the beautiful tree lined street! 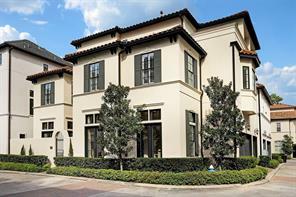 In addition, it's located in one of Houston's most desirable neighborhoods. Beautiful pool on location. Foot & bike paths lead directly to Memorial Park (less than 2 minutes). 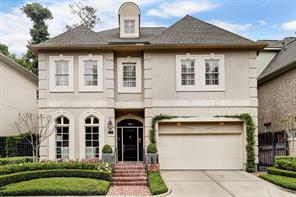 Minutes from Galleria and Energy Corridor and zoned to MEMORIAL SCHOOLS. The first floor has a large living/dining area to entertain guests as well as breakfast area that can act as a separate den or family room along kitchen. Situated on the second floor are 2 bedrooms, each include suite bathrooms that been COMPLETELY renovated along with nice walk-in closets. New windows, full plumbing newly updated along with partial electrical wiring. Move-in ready! Make an offer today to take advantage of this opportunity. 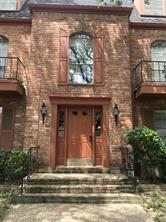 Location,Location Great Galleria area condo with popular 2/2 split plan and two (2) assigned and covered carport in beautiful tree lined N Post Oak Lane, the unit is on the 2nd level. All utilities and WiFi and much more are included in HOA. all Granite counter top spacious kitchen with stain less still appliance,new paint, fixtures,grown molding and new high end designer carpet, Large walk in closets and master bedroom with offset dressing and vanity area,spacious living and dinning room with beautiful display selves.Manned security control, easy access to freeways, parks and downtown. Location, location, location! 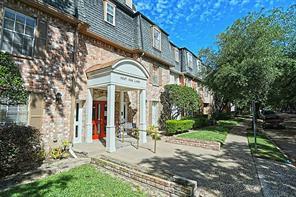 Convenient to Uptown, Galleria and walking distance to Memorial Park. Light and bright with seven windows overlooking pool and lush landscaping. Wood laminate floors, tile floors and carpet in bedrooms. Kitchen is up to date and washer/dryer located there for convenience. Blinds on all windows, third bedroom could be study with built-ins. Spring Branch schools. Quiet, convenient and with security. Perfect for lock and leave living. 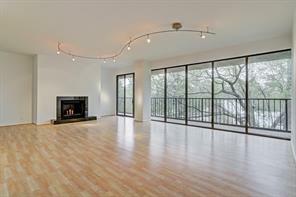 Stunning updated condo in the heart of Memorial! All utilities included (cable, water/sewer, electric, patrol, grounds, recreational facilities). Wonderful curb appeal on this private second floor location with easy access from the main entrance. This home has been updated from top to bottom. Updates include: windows, paint, carpet, door knobs, fixtures, toilets, doors, Quartz counter tops, subway backsplash, tile wood floor, bath tub, lighting, kitchen cabinets and appliances. Additional living space off the family room can be a study, play room, nursery or made into a true 2nd bedroom. 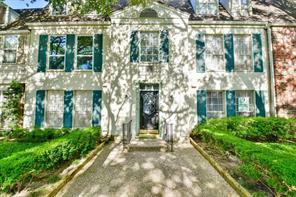 The Post Oak Lane condominiums are a true hidden gem zoned to amazing SBISD schools near the Galleria with an easy central location to all major thoroughfares. Gated enclave. Beautiful condo with two master bedrooms and two-and-a-half baths. Abundant natural light fills this home. Neutral color palette. Double pane, insulated windows installed throughout, April 2018. Recently installed carpet and fresh paint. 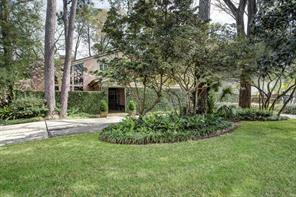 Excellent investment opportunity on coveted N. Post Oak Lane. Two area pools. Memorial Park, the Galleria, Uptown Park shops and The Houstonian are easily walkable / bikeable. Water, gas, electricity, basic cable and community amenities are included within monthly maintenance fee of $646. Lock and go convenience! A must-see! 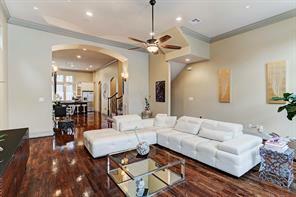 Sophisticated chic condo near I 10/610. Premium unit location above the 24/7 manned guard house. Second floor condo on one level. Zoned to SBISD Memorial HS. Ease of all inclusive living. HOA fee includes 24/7 guard, electric, hot and cold water, sewer, valet trash pick up, recycle dumpster, basic cable, bldg and grounds ins and maintenance including roof. HOA on-site property manager 5 days a week and on call for emergency. Full time maintenance person, full time porter. 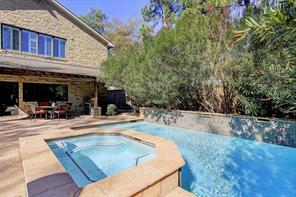 Two gorgeous pools, clubhouse can be reserved for private use (cleaning fee add'l chg). Assigned covered parking, ample guest parking and storage unit. All appliances are included. Master BR has 2 walk in closets, plus linen closet and add'l closet. Recent "barn" type sliding door added to master BR & bath entrance. 2nd BR has a walk in closet and new paint. Abundance of storage. Energy efficient windows added in 2018. Condo can be sold furnished, few exclusions. Private balcony off LR. Lock and leave lifestyle. Location Location Location!!! Welcome To This Hidden Treasure...The TreeHouse Condominiums. 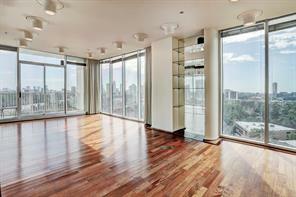 These Units Are Highly Sought After And Rarely Do You See A 2 Bedroom. Just One Block From I-10 And Just Off Chimney Rock. You Are Within Minutes Of Everything!! Downtown, Midtown, Medical Center and The Galleria! If You Enjoy Peacefulness And Relaxation You Will Love This Fabulous Condo. 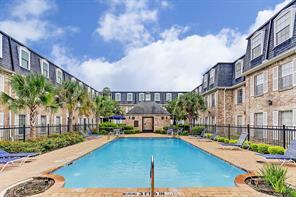 The Balcony Is Private Overlooking The Bayou And The Pool/Fountain, This 2nd Floor Condo Make The View Grand!! 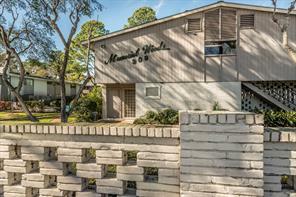 This Condo Features 2 Large Bedrooms and 2 Bath With Large Closets And Lots Of Storage. A Wall Of Windows In Both The Living Room And In the Master Suite Make Your Treehouse So Cozy. The Living and Master Have French Doors Opening To Your Treehouse Paradise. The AC Was Replaced In 2010 Furnace 2016. Hardwood Floors Completed in 2014. Blinds and Double Paned Windows Replaced 2014. Washer and Dryer Stay Replaced 2016. Bosch Dishwasher 2014 Disposal 2015. Don't Wait!! MOTIVATED SELLER. NEW ON MARKET. THE 1ST 2 BEDROOM/2 BATH ON THE 1ST FLOOR THAT HAS CAME ON THE MARKET IN OVER 1 1/2 YEARS. LOCATION, Easy Access to I-10, 290, 610 & Galleria/Memorial. Buyers get to pick out their own color carpet. HOA fees includes; Electric, Water, Sewer, Cable TV, Trash (pickup at door), Insurance on the Exterior Buildings/Grounds & 24 Hour Manned Guard. This condo features: Hardwood Flooring, Carpet in Bedrooms (pick out your own new color) & Tile in Wet Areas. Community Features: 24 Hour Manned Guard, 2 Area Pools, Gas BBQ Grills, Community Clubhouse. Reserved Assign Parking & Large Storage Unit. Great Memorial Schools. The subdivision is located minutes to Uptown Park and Galleria. Unit has been upgraded. It has a nice patio, huge dining room and living room, laminate flooring in living/dinning room areas and hallway. New Full size washer / dryer and ALL UTILITIES PAID (water, electricity, basic cable). LOCATION, LOCATION, LOCATION. Easy Access to I-10, 290, 610 Loop, Memorial Park, Uptown Park & Galleria. 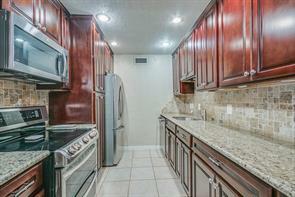 Chef's Kitchen Features: New Kitchen Cabinets, Sink, Faucet, Flooring, Appliances. 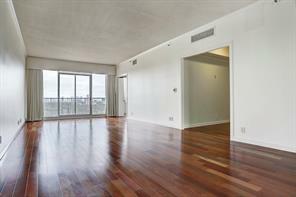 Remodeling of Condo Features: Engineering Wood Floors. Designer Interior Paint. Crown Molding. New Light Fixtures, 6 panel doors. New Ceiling Fans. Recessed Lighting. Thermostat. Guest Bathroom with newer large vanity. Large Storage Unit. HOA to include: Electric, Cable TV, Water, Sewer, Trash Pickup at Door. Community Features: 2 Gorgeous Pools - Open Year Round, BBQ Gas Grills & Clubhouse. Assigned Covered Parking. Great Memorial Schools. This lovely condo is just completely renovated, with beautiful contemporary look,with brand new AC duct installed completely remodeled living room, kitchen, bathrooms and rooms, facing pool, newly installed multi colored electric fire place gives this condo beautiful and elegant look, less than block away access to I-10, within minutes from Memorial park, Galleria, Downtown, Uptown, City Center, all utilities paid in HOA including Tv cable, electric, water, gas, building insurance, NO hurricane Harvey flooding. This well maintained 2 bedroom features an open floor plan, a light and bright kitchen, a spacious and window-lined bonus nook that over looks one of two pools on property, and 2 fully updated bathrooms. 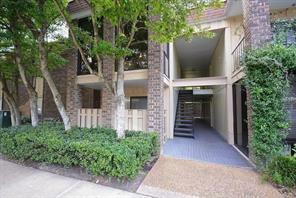 You will love this unit and the second floor location at Bayou Woods! Agent is owner. Unit is vacant and is easy to show. INCREDIBLE VALUE! ALL BILLS PAID! (WATER,CABLE,ELECTRICITY) This breathtaking ground-floor unit situated on a beautiful court-yard is a must have! In one of Houston's most desirable neighborhoods, and within walking distance of beautiful Memorial Park, you'll love the convenience of living in this quiet community that has a manned security gate and on-site management. Well-maintained condo has several updates, including fresh paint and tile flooring and a huge study or second bedroom. This home is ready for move-in! In this location, at this price, it won't last long! Come see this beautiful Condo! New Roof, - New A/C. The condo was completely renovated on 2016. Electric, water, gas, basic cable, sewer, trash, building insurance, maintenance of common areas) are included in the monthly HOA. Washer/Dryer and Fridge are included. With 2 bedroom, 2 bathroom, studio that can be converted in guess room. Covered balcony with the pool view. 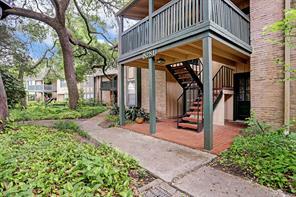 Located near I-10 within minutes of Memorial Park, Downtown, Galleria, Uptown Park, City Center & Memorial Mall. No hurricane Harvey flooding. NEW ON MARKET. All Utilities Paid by HOA. LOCATION, LOCATION, LOCATION. 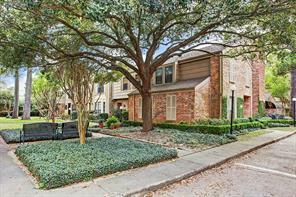 Easy Access to I-10, 290, 610 Loop, Memorial Park, Uptown Park, Galleria & Million Dollar Mile. 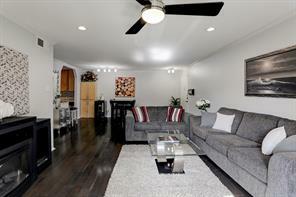 Stunning Unit that has been Completely Remodeled. Welcome Home to this Gorgeous Unit. Hardwood Flooring in Dining/Kitchen/Living Areas. Double Paned Windows Throughout This Unit. 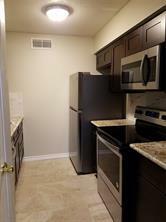 Kitchen Features: Granite Countertops, Stainless Steel Appliances, New Hardware, New Kitchen Faucet & Sink. New Interior Paint. Crown Molding. New Carpet in Bedrooms. Both Bathrooms have New Granite Countertops, New Faucets, New Lighting Fixtures & New Tile Flooring. Don't Miss the Huge Custom Designed Closet in Master Bedroom. The Laundry Room Features: State of the Art Washer & Dryer. Parking is Located Right Under the Unit. Community Features: Gorgeous Pools (Open Year Round), Clubhouse, 24 Hour Guard at Entrance & BBQ Grills for your Families Enjoyment. Don't Miss Owning This Beautiful Property. 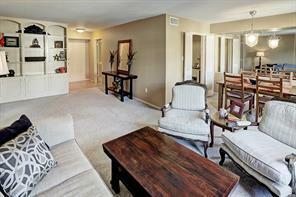 This condo offers a spacious floor plan with plenty of room for large living area furniture and a dining room table. The kitchen has granite counter tops and white cabinetry. 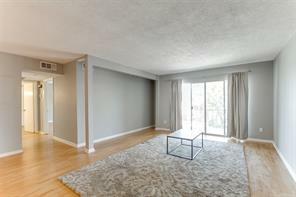 There is no carpet in this condo which makes for easy cleanup and a light airy feel. The bedroom and bath are also quite spacious! Easily rest on a king size bed with space for extra seating area if desired. Hang out on the balcony or enjoy the two beautifully kept pools. **There is no unit above or below. ** All non-residents check in with an attendant 24 hours a day. Centrally located with easy access to the major freeways. This community is wonderful!!! A MUST SEE! 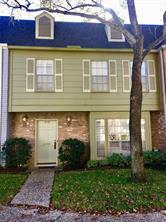 Beautiful townhome in Memorial, close to Memorial Park, minutes away from the Galleria and zoned to the best school in Spring Branch District. 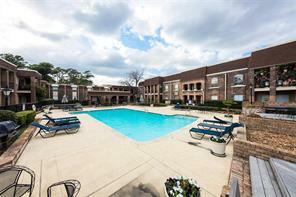 Wonderfully located, near 610, I-10 and Memorial Drive, giving you access to all areas of Houston. This property is priced well and All appliances are included! The HOA covers all the utility fees except for the internet. Showing start this weekend! Cute first floor unit on beautiful tree-lined street. Large living room, with nice sized kitchen and dining areas. Granite countertops. Large bedroom with walk-in closet. Desirable location with easy access to the freeway. Gated Community. Covered parking at rear of the unit. Refrigerator, washer/dryer, and utilities (electric and water) included. Upgrades Upgrades Upgrades , This Beautiful unit has been completely redone. New Floors , New marble counter tops in both kitchen and bathroom. 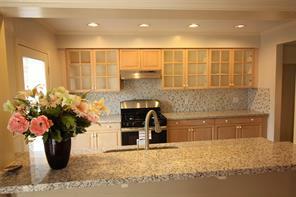 Kitchen cabinets are custom made , Counter tops and sink are custom as well. Brand New Refrigerator never used. All kitchen drawers are soft close. Back window glass is brand new custom made. Bathroom has been completely redone as well new counter tops , faucets and custom built shower. This Unit is a MUST SEE!!!! It has all the bells and whistles. Thanks for showing.. LOCATION. CONDITION. PRICE. This condo has it all! 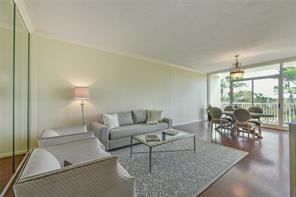 Completely remodeled, turn key Memorial area condo. 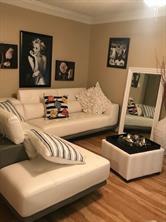 European inspired 2/1 condo is being offered FULLY FURNISHED. Unit is meticulously maintained offering bamboo floors, custom closets, built-in storage, new plumbing, etc. Kitchen boasts fantastic use of space with granite counters, stainless appliances and ample storage. Unit was restored from studs up. Perfect location for easy access to Houston's Energy Corridor, biking to Memorial Park, dinner Downtown or shopping CityCentre. Call for your tour today! LOCATION!!!!! !GREAT SPACIOUS CONDO LOCATED STEPS AWAY FROM ARBORETUM /MEMORIAL PARK, ONE BEDROOM FEATURES WALK-IN SPACIOUS CLOSET. UNIT IS ON SECOND FLOOR FEATURES AN EXTRA ROOM COULD BE STUDY ROOM WITH BALCONY OVER LOOKS THE COURT YARD. OFFERS A SPACIOUS LIVING ROOM AND KITCHEN WITH GRANITE COUNTER TOPS, WASHER AND DRYER AND FRIDGE ARE INCLUDED. NEW CARPET. ALL UTILITIES INCLUDED IN HOA FEE. PET RESTRICTIONS TO BE VERIFIED WITH HOA. GREAT PRICE! 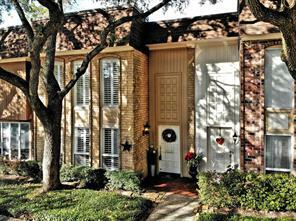 What a fine condo community ideally located near “Houston’s Heart” amidst all the exciting events & H-Town happenings! 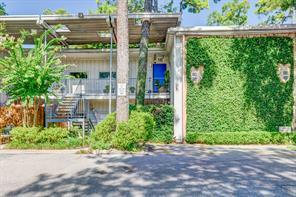 Enjoy the quiet and lush wooded surroundings of Bayou Bend Condo Community featuring 2 Area Pools and 4 Central Laundry Rooms (key required for access 24/7). This 2nd floor home overlooks the serene West Pool Courtyard! 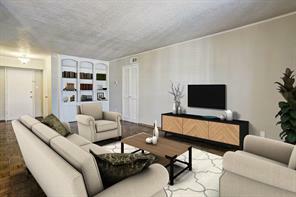 It was originally 2 bedrooms but seller converted the home into a 1 bedroom creating spacious living! Seller now uses 1 Living Area as a Home Office. Easy access to I-10, HWY 290, 610 Loop & The Beltway… just minutes from The Galleria, Memorial City, City Centre, Downtown, Uptown Park, Midtown & Memorial Park! All bills are included in monthly HOA, including Basic Cable except for internet. The home has 1 reserved parking space conveniently nearby = #O2. Central Laundry is a stone’s throw from this abode! All room dimensions are approximate, please verify if necessary. LOCATION! LOCATION! LOCATION! CONVENIENTLY LOCATED IN CLOSE-IN MEMORIAL JUST YARDS FROM THE INNER LOOP AND CLOSE TO UPTOWN PARK. THIS CHARMING 1 BEDROOM 1 BATH FIRST FLOOR CONDO COMES WITH 1 COVERED PARKING SPACE. IT HAS A FENCED IN PATIO, OPEN CONCEPT LIVING AND DINING AREAS. 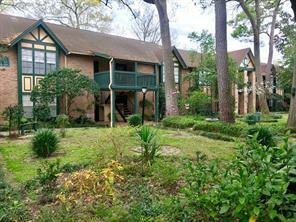 THE COMPLEX HAS A GUARDED ENTRANCE, 2 POOLS AND LOVELY LANDSCAPED, WOODED GROUNDS. REFRIGERATOR, WASHER AND DRYER INCLUDED. TILE AND GRANITE COUNTERTOPS. CLOSE TO HOUSTON BAPTIST CHURCH, IKEA, EDWARDS. Enjoy your morning coffee with a wonderful view of the lush and serene bayou from your spacious private balcony as well as lots of greenery in this quiet and established neighborhood. 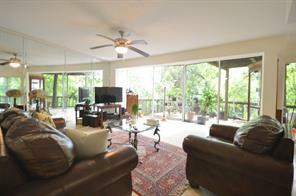 First floor 2-bedroom condo with large deck that faces wooded view. 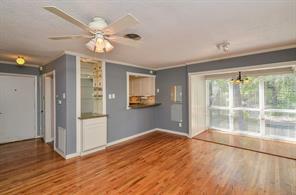 New W/D, New SS appliances, new Laminate floors, New paint, Living room/dining room combo. Breakfast room opens to deck. Granite countertops. Laundry room off of the kitchen. Memorial community. 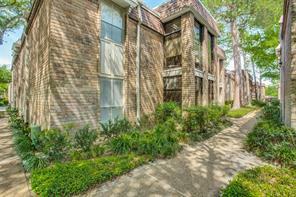 Ideally located near I-10 within minutes of Memorial Park, Downtown, Galleria, City Centre & Uptown Park! ALL BILLS (ELECTRIC, WATER, SEWER, TRASH AND BASIC CABLE) ARE INCLUDED IN THE MONTHLY HOA! 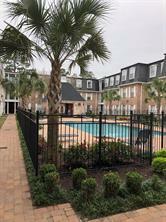 The 2 grand pools (West Pool and East Pool) are surrounded by lush grounds and gorgeous mature trees! Zoned to ever popular Spring Branch ISD! Larger one bedroom floor plan with open flexible use area for dining room, living room, study, etc. Maintenance fee includes electricity, basic cable, water/sewer, maintenance and landscaping of grounds, and on-site patrol. 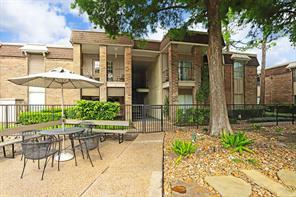 Well-maintained, first floor unit overlooking the pool in highly-sought after Post Oak Lane Condominiums zoned to SBISD. Plantation shutters and crown molding throughout. Wood laminate floors in main living areas and bedroom. Granite countertops with stone backsplash and modern paint colors in kitchen. Room for small breakfast room table and chairs in the Kitchen. Bathroom features a marble countertop and marble-topped shower seat with stone surround. There is an abundance of storage. A/C replaced in 2017. Washer and dryer included (new in 2018). 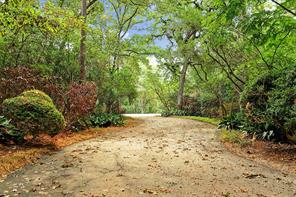 Excellent location with great subdivision and highly sought school district (SBSID). 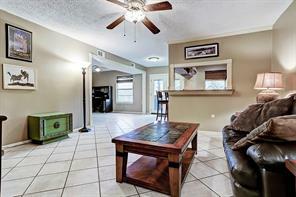 Property features with crown molding, mirror accent walls, recessed lighting, and ceiling fan. Den with double french door can be utilized another bedroom. Double Sinks in marble vanity, and second bedroom features french doors viewing onto foyer and living areas. New HVAC in 2018! Maintenance fee includes all utilities. Location! Location! Location! Gorgeous one bedroom condo with new appliances, new floor, fresh paint. Living room has walls of glass doors which brings ample natural light, and large balcony to enjoy your day after work. 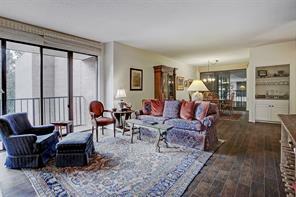 Condo is conveniently located in the middle of shops, restaurants, groceries. Easy access to I-10, 610. Galleria is only 10 mins away. Call to see this home and make it your own. An investor opportunity!! Immediate availability! Motivated seller! See Agent Remarks! Immaculate 2nd level unit with abundance of upgrades, including kitchen with granite counter tops and farm sink, cabinets with roll outs, upgraded bathroom with beautiful walk-in shower. Freshly painted! Living room offers wall of windows and access to a balcony overlooking the bayou. This unit is close to so many great places! City Center, Memorial City Mall, Marq-E Entertainment Center are all just minutes away. 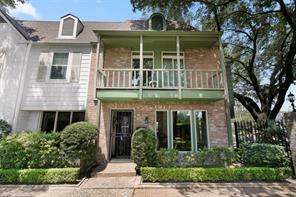 Plus it has a convenient access to Freeway, Downtown and Galleria. The property offers a peaceful pool and lovely green area. Great quality living for a great value! 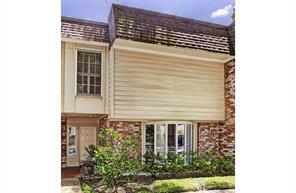 Must see this downstairs 2 bedroom 1 bath condo in Bayou Woods. You will not believe the price on this lovely home. Great location overlooking the pool. Flooring has been updated with wood look laminate. Tile flooring in the Kitchen and Bath. Refrigerator, washer and Dryer included. HOA includes utilities. Call today, at this price won't last long. Ample CORNER unit features one bedroom with large closets and a flex space that can be an office, a yoga retreat or an extra room - filled with natural light. It has an open space with different possibilities in the living areas, the sliding doors allows you to access to the tranquil balcony. ALL BILLS ARE INCLUDED IN MONTHLY HOA! Zoned to great schools. 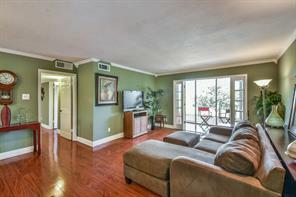 Perfectly LOCATED very close to I-10 and minutes away from Galleria and City Center. Fridge included. Extra storage space included. All utility bills included. A lovely 2 bedroom 1.5 condo with lots of potential in great school district. Wood floor through out the unit. Spacious balcony and beautiful bayou view from large back yard. Large master bedroom walking closet. 24 hours neighborhood watch patrol. Close to I-10 and Galleria. Must see! 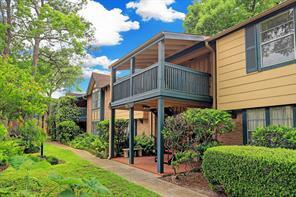 This quite Condo is located in a lushly landscaped community just off I-10 West at Wirt Rd. Great Location. this property comes with all the appliances, was beautifully updated only a short time ago. It has cedar lined closets, window coverings, upscale ceiling fans, and all the floors are hard surface for easy cleaning. There is a community pool for summer enjoyment, and very green sitting areas for daily meditations. Come enjoy your very own quiet retreat in the heart of the Memorial area. This 1 bedroom/1 bathroom unit comes complete with washer and dryer connections in unit and a recent A/C (2017). Conveniently located to I-10 and just minutes from the Galleria, Memorial City, Downtown, City Centre and the Energy Corridor. 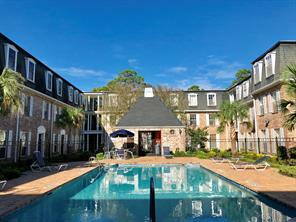 Bayou Bend offers two swimming pools, mature landscaped courtyards and lock-and-leave lifestyle. Monthly maintenance fee includes electricity, basic cable, water, sewer, trash, exterior ground and building maintenance. Zoned to highly acclaimed Spring Branch ISD Schools - Hunters Creek Elementary, Spring Branch Middle and Memorial High School. 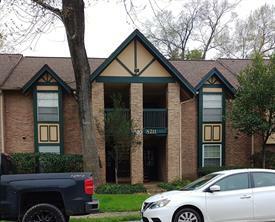 Super location just minutes from Downtown, Galleria and Houston Medical facilities. Ground level unit with assigned parking attached and storage unit. On site guard, two swimming pools, club room and lovely maintained grounds in parking like setting. This unit has assigned covered parking and storage unit just outside the unit. This Memorial in town location is great for many locations including Galleria, downtown, against traffic for energy corridor. This 1 bedroom 1 bath is ready for a new owner that wants to do some updates. It also is zoned to exceptional SBISD schools of Hunters Creek Elementary, Spring Branch Middle, and Memorial High School. Get in now and pay for your updates not someone else's. It is a quiet unit not backing the freeway and it has a lovely view overlooking the pool. Maintenance fees cover electric, cable, water, guard, 2 pools, exterior, and trash three times a week. This estate sale is sold "as is". Bring your buyers or investors.It also is zoned to exceptional SBISD schools of Hunters Creek Elementary, Spring Branch Middle, and Memorial High School.